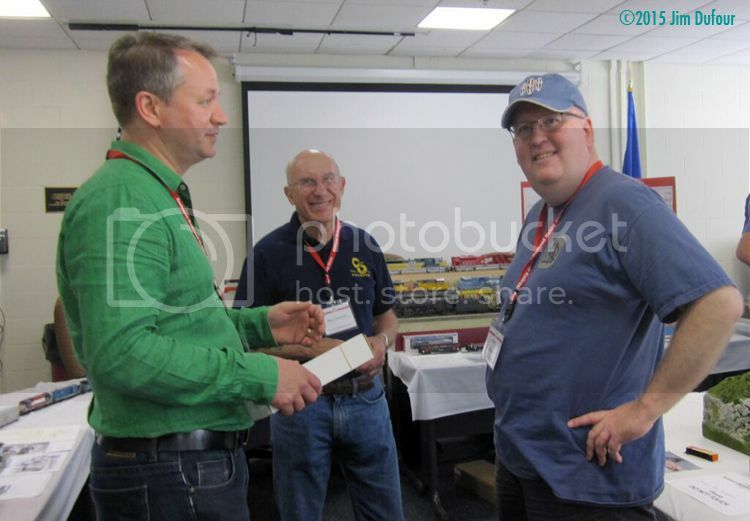 Over the weekend, Pierre Oliver and I attended the 13th annual New England / Northeast Railroad Prototype Modelers meet in Collinsville, Connecticut. We had a great time. The hundreds of examples of finely detailed and finished equipment are always a draw at RPM meets. But step back from the display tables and it’s the opportunity to renew friendships and create new ones – with like-minded enthusiasts – that really drives the prototype modelling movement. The above photo is a good example. The gentleman in the middle is Glenn Glasstetter. It’s the first time we’ve met and we got along famously. I really enjoyed talking with Glenn and was delighted to discover that he knows my good friend Michel Boucher. Great to meet you, Glenn! On the “renewal” side, it seems like Marty McGuirk and I have known each other forever, but it’s been several years since we’ve seen each other. It was wonderful to spend some time with Marty – to discuss layout plans, interesting characters in the hobby, manufacturing, and much much more. A tale about cats and model railroads had Pierre and I in tears. Marty – I hope it’s not so darned long between get-togethers. Come up for a visit sometime! Of course, there were many other friendships established, and others renewed – and with 180 attendees, there are too many to list here. But thank you, everyone, for contributing to such a terrific weekend. Thanks also to the organizers for putting together a great event. Well done! As for the displays… there are always many online galleries filled with photos of models after events like these, and I’m working up a report with photos for Railroad Model Craftsman magazine, so I’ll leave it at that. If you have never attended one of these meets, I encourage you to do so. You do not have to bring models to display, although I hope you will. It can be intimidating to put your work in front of such talent, but I find that the most accomplished people in the hobby are almost always the most polite about one’s work. Perhaps it’s because they remember the time when they were barely able to glue together two pieces of styrene or wood – and remember the encouragement they received from those more accomplished in the hobby. This hobby is about sharing skills and techniques as much as it is about friendships, so that we can all become better modellers. And RPM meets are a great way to do that. This entry was posted in Beyond Port Rowan in S, equipment, prototype influence by Trevor. Bookmark the permalink. Thanks for the report Trevor! I’m psyched you were able to make it to Collinsville – I’m just bummed I had to miss it this year, and miss seeing you and Pierre. Hope you’re able to make it again next year! I really need to get to this meet some time. Each year I read the reports of the show and regret not attending just that much more. Thanks for a little more and I’m looking forward to the report in RMC. While I’ve got this open, we’re hosting our first RPM in under a month here in the Maritimes, in Truro on June 27th. I’m a real admirer of the RPM concept and looking forward to seeing what we can do with it here in Atlantic Canada. That’s great news, Chris – do you have a website for the RPM?